When so many things are ripening all at once in the garden, this potato salad makes good use of several vegetables. My mother used to make this salad all the time in the summer when we had so many tomatoes and green beans in the garden. I have added pancetta and capers to her dish because I like the saltiness of the pancetta and capers with the potatoes. When boiling the green beans and potatoes, make sure the the water is well salted and boiling before you add the vegetables. This kind of water will help the potatoes to hold their shape and keep the beans bright green. It is a method you should remember, because it makes a big difference. I have used separate pots to boil the green beans and potatoes in, but more often than not I use one big pot and boil the green beans first, scoop them out with a strainer and then add the potatoes to the same water. Why dirty two pots when you can do it with one? If you are making this dish ahead of time and not serving it right away, you should plunge your cooked green beans immediately into an ice bath. This will retain their bright green color and stop them from further cooking. An ice bath is simply a large bowl full of ice water. Let them sit in the ice bath until they are cooled and then drain them and dry them thoroughly. How long you cook the green beans is a matter of personal taste but I do not like the raw taste of an undercooked green bean. Too many people think that the right way to cook green beans is to leave them undercooked, which is wrong. I wrote about what Julia Child's opinion was on this subject in an earlier post. You don't want the green beans to be overcooked and mushy, but you want any raw flavor cooked out. For the capers, don't use capers packed in vinegar. 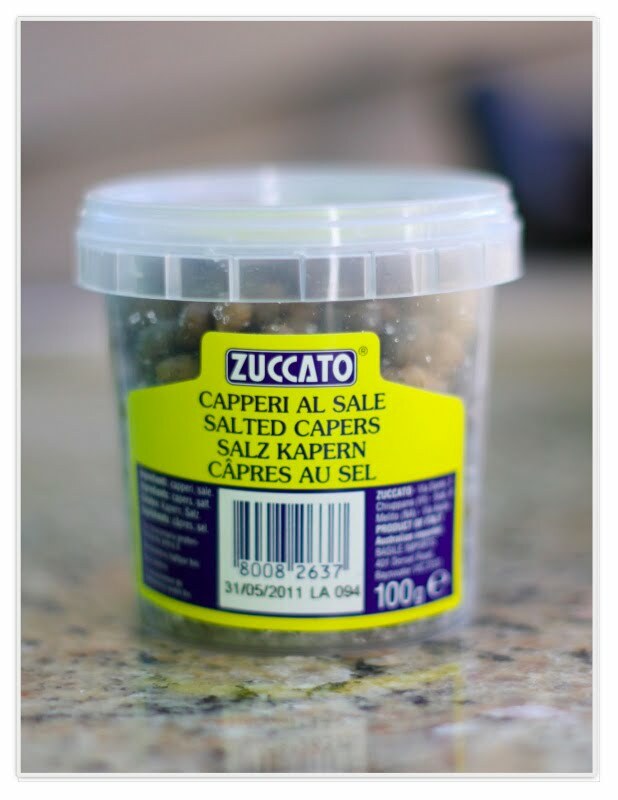 Buy capers packed in salt. Give them a little rinse before you use them. They have a superior flavor and are worth purchasing. I always have my pantry stocked with them. Bring a large pot of well salted water to a boil. Plunge green beans in and cook until just done but still slightly firm. Scoop out with a strainer and set aside in a large bowl. Bring the water back to boiling and drop in the potatoes. Bring back to boiling and cook until potatoes are tender but still firm, about 12 - 15 minutes, depending on the potato. Check by piercing a potato with a small sharp knife. Drain potatoes and add to the bowl with the beans. Meanwhile, chop pancetta and fry in a small skillet until nicely crisp. Drain on a paper towel. Add to green beans. Add tomatoes, onion and capers. Season with salt and pepper. In a small cup, whisk together the olive oil and vinegar. Add to salad and toss gently. 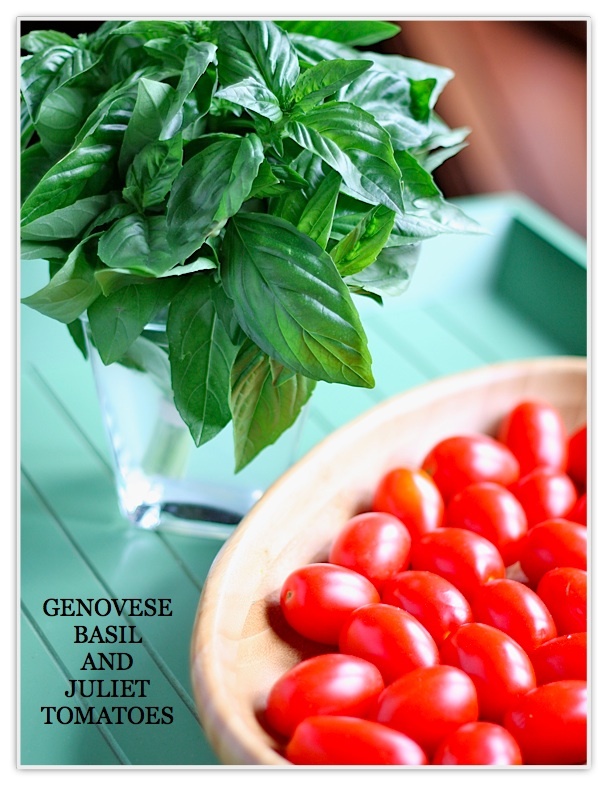 Slice the basil leaves and add to salad. You might also like my other potato salad with eggs and capers. I guess we both had salads on the brain today- what a gorgeous use of summery veggies! This is a salad I've eaten a million times, but i like your addition of the salted capers. And, sometimes I just forget about that ice bath. A good reminder.The photo is gorgeous. I am going to try the recipe, sounds wonderful! Simple perfection! Love the pancetta in there! 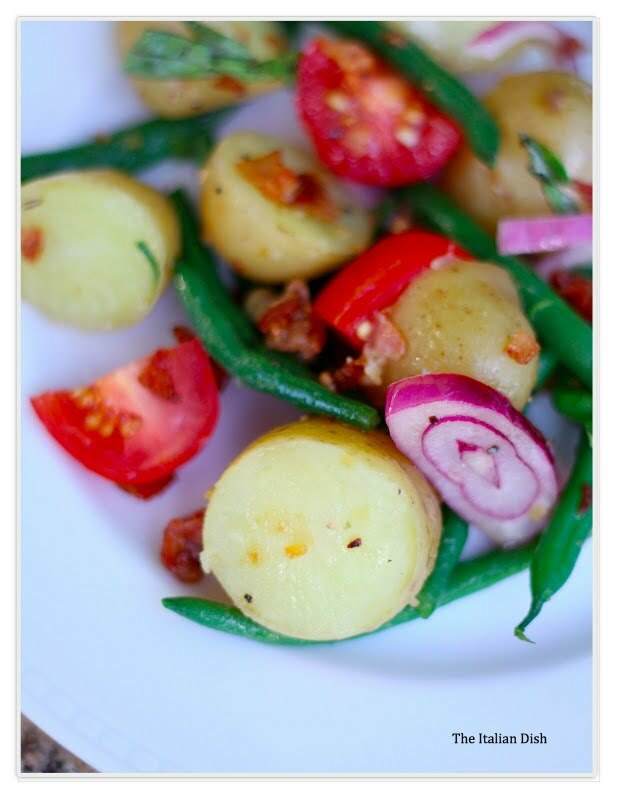 This looks beautiful, and I couldn't agree with you more about not undercooking green beans. I cook them exactly the way I cook spaghetti - in tons of boiling salted water and taste, taste, taste until done just right. Then I drain them, toss them with butter or olive oil or the fat that has just dripped from a rotisseried chicken, and sprinkle with Maldon sea salt. Mmm Elaine - another tastey dinner - perfect for tonight! This sounds delicious. I can't wait to try it. This is a stunning blog and a fantastic looking salad! Thank you. Thanks for the tips about buying capers! I didn't know this ever! No wonder mine don't have any taste!!! I love your blog! Thanks for sharing and for posting wonderful recipes/ tips/ suggestions. 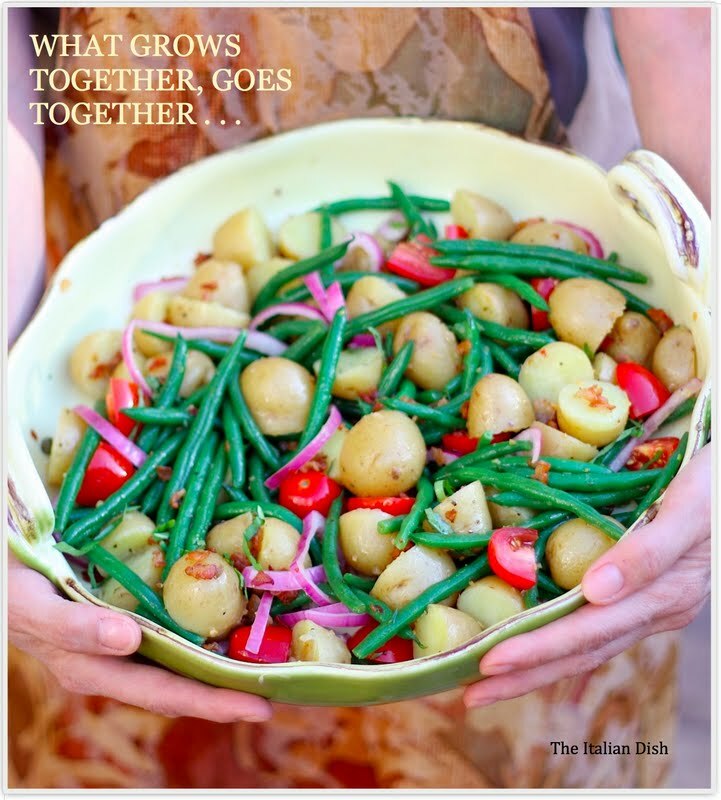 We have a second home in Florida and are planning a Clambake and would love to serve your Italian Potato Salad with Green Beans, Tomatoes and Pancetta with it. Can you please tell me how many it serves? We are having 6......unless you suggest something different. Fabulous salad! I love the blog...the layout if perfectly balanced. drives me and pushes me to become a better cook. Carol: Thank you so much! Happy cooking.